This is a set of five dies. The chair is 1-1/2 x 1-3/4 inches. These are US-made steel dies compatible with most table-top die cutting machines. Summer themed craft dies. Karen Burniston dies will give an added touch to any paper project and are compatible with most die-cutting machines. Steel cutting die from Elizabeth Craft Designs. Compatible with most leading die-cutting machines. Cup Die Size: 2.5" x 3.2", 6.35 cm x 8.1 cm. Impression Obsession craft die featuring the sentiment "Hello Summer". This is a set of 2 dies. The word hello measures 5/8 x 1-1/4 inches and the word summer measures 1/2 x 1-3/4 inches. These are US-made steel dies compatible with most table-top die cutting machines. Impression Obsession craft die featuring a pair of Tubers having fun in the Summer. These are US-made steel dies compatible with most table-top die cutting machines. 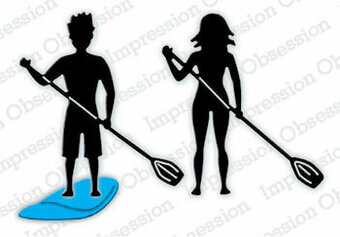 Impression Obsession craft die featuring a pair of Paddleboarders. These are US-made steel dies compatible with most table-top die cutting machines. Embossing Folder from Sara Davies featuring a border with butterflies, dragonflies, and flowers. The Shapeabilities Summer Canopy and Elements Etched Dies Four Seasons by Lene Lok is a set of three dies includes Adirondack Chair, rope swing and canopy of summer leaves. Immerse yourself in nature's beauty symbolized in texture, elements and design that have been created in the Four Seasons Collection by Lene Lok. Spellbinders Shapeabilities cut, deboss, emboss and stencil with a single etched die template. Approximate Size: Rope Swing: 0.85 x 1.15 in. 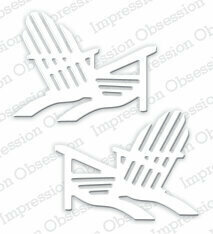 2.20 x 2.90 cm, Adirondack Chair: 1.25 x 1.60 in. 3.20 x 4.10 cm, Summer Canopy: 4.15 x 2.65 in. 10.50 x 6.70 cm. Craft dies featuring Drinks. Work with any manual die cutting machine. Use with a magnetic base plate and die cutting plate. These 48 sheet packs include 12 different designs. The 6" x 6" size makes these papers ideal for card making but equally fitting for creating accents and embellishments for a variety of paper-crafting applications. Acid free, lignin free. Picnic themed craft dies featuring watermelon and ants. Happy Summer Lawn Cuts coordinate with the stamp set Happy Summer. This is a set of nine dies. The tall sandcastle is 1-1/2 inches tall, the smaller castles are around 1 inch, and the pail is 5/8 inch. These are US-made steel dies compatible with most table-top die cutting machines. This is a set of two dies. The surfboard is 2-5/8 inches long and the car is 3-1/4 inches long. These are US-made steel dies compatible with most table-top die cutting machines. This is a set of 2 dies. The chair is 1-1/2 x 2 inches. These are US-made steel dies compatible with most table-top die cutting machines. The umbrella top is 1-1/8 x 2-1/4 inches. These are US-made steel dies compatible with most table-top die cutting machines. Elizabeth Craft Designs-Summer Peel Off Stickers. Use these stickers to add an additional picture to any scrapbooking page or handmade card! This package contains one 9x4 inch sheet of stickers. Available in a variety of colors, each sold separately. Acid and lignin free. Imported. Sized to fit the Adirondack Chair die (FRA10464), the beach umbrella measures approximately 3.25" x 4.5" when assembled. The detail cut lines making up eash section of the canopy make it easy to either make this all one color, or to snip apart the sections to create a multi-color umbrella. This is a set of nine dies. The largest drink is 1-1/2 inches tall and the smallest drink is 3/4 inch tall. These are US-made steel dies compatible with most table-top die cutting machines. 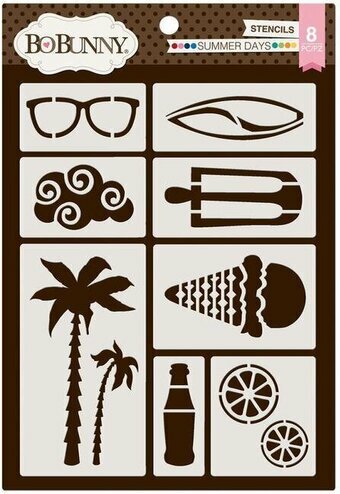 Relax by the beach or by the pool with this set which includes: Adirondack chair, table, beach bag, sunglasses and more! The chair measures approximately 2.75" x 2.5" when assembled. The little beach bag measures approx. 1.2" x 1.6". There's even a little bottle of lotion and a tiny drink to round out the set! Relax on the beach with your canvas chair and umbrella. The beach chair assembles to 2" x 1.5" and the umbrella is 3" x 2.25". Frantic Stamper Precision Dies are made in the USA and will work with most leading table-top consumer die cutting machines. 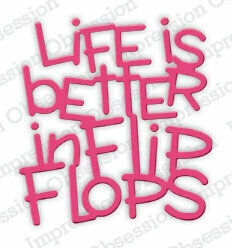 Impression Obsession craft die featuring the summer sentiment "Life is Better in Flip Flops". This is a single die measuring 2 x 2-1/8 inches. These are US-made steel dies compatible with most table-top die cutting machines. Super fun set of three little 1"x1" postage squares, each with a little cutout (heart, star and smiling sun). There are so many things you can do with these, from building a border for a scrapbook page, to creating a grid of alternating color stars or hearts. So much fun! 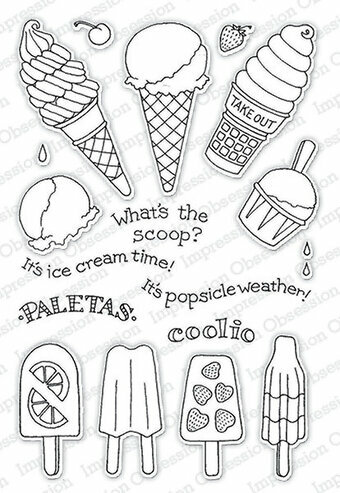 Give your summer crafts a sweet look with this popsicle embossing folder. Pair this imprinting tool with a vibrant sheet of heavyweight card stock and most any embossing machine to create quick, easy designs. Folder: 4.25 x 5.75 inches. Popsicle graphic: 2.5 x 4.875 inches. 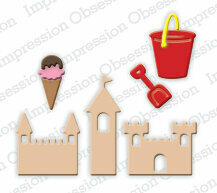 Summer themed Impression Obsession craft die featuring popsicles and ice cream. These are US-made steel dies compatible with most table-top die cutting machines. This is a set of 13 dies. The popsicles measure 1-3/4 inches tall and the center ice cream cone measures 1-1/8 x 2-1/4 inches. 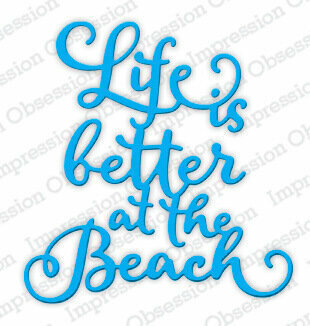 Impression Obsession craft die featuring summer and beach themed images and sentiments. These are US-made steel dies compatible with most table-top die cutting machines. This is a set of 9 dies. The chair measures 1-1/2 x 1-1/2 inches and the sun measures 7/8 inch in diameter. 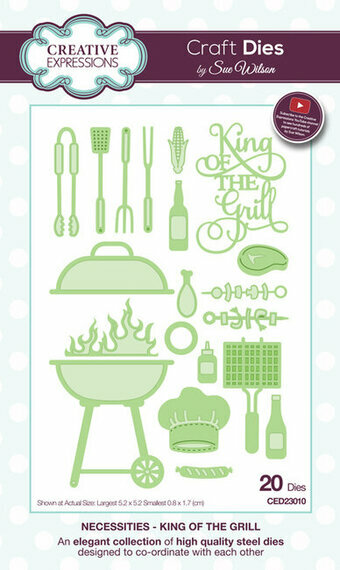 Creative Expressions Necessities Collection King of the Grill. An elegant collection of high quality steel dies designed to co-ordinate with each other. Celebrate the grillmaster in your life with this Summer-inspired die set. Great for Summer cards or scrapbook layouts. Designed by Sue Wilson. Includes 20 craft dies. Size: 2 x 2 inches - 0.3 x 0.7 inches. Impression Obsession craft die featuring a flower. This is a single die measuring approximately 2 x 2-1/2 inches. Summer themed craft dies featuring a palm tree, a beach ball, flip flops, and a flamingo. Karen Burniston dies will give an added touch to any paper project and are compatible with most die-cutting machines. BoBunny Essentials Thick Stencils. 9.5" x 6.5". 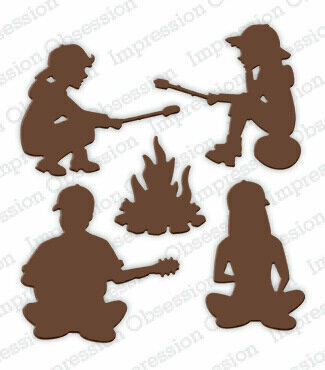 Impression Obsession craft die featuring a family enjoying a Summer camping trip. This is a set of 5 dies. The people measure around 1-1/2 x 1-5/8 inches and the fire is 1 x 1 inch. These are US-made steel dies compatible with most table-top die cutting machines. This summer themed CottageCutz die features flip flops. CottageCutz are thin metal dies, like a QuicKutz. They are easy-to-use and add great detail to any craft project. This die is compatible with the following machines: QuicKutz Squeeze, Revolution, Sizzix / Ellison Big Shot, BigKick, CuttleBug, SpellBinder Wizard and Accucut Zip'eMate. Adapters/shim may be required on some machines. Made in the USA. 100% lead free. Large Flip Flop - 2-1/4" x 1". Small Flip Flop - 1-1/8" x 1/2". This die can cut beautifully embossed designs that will look fantastic on any favorite paper craft project! They can also be used like stencils. This die can be used in most leading die cut systems. This is a set of 8 dies. The small flip flops are 1 inch tall and the large flip flops are 2 inches tall. These are US-made steel dies compatible with most table-top die cutting machines. 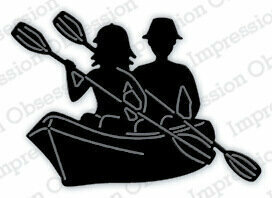 Impression Obsession craft die featuring two people in a kayak. This is a single die measuring 1-7/8 x 2-5/8 inches. These are US-made steel dies compatible with most table-top die cutting machines. Popsicles are the perfect treat for a hot summer day. They typically come in two versions: the single pop, or the double pop. We give you both styles plus one stick which you can cut again to make the double popsicle. Approximate assembled size is 1.6" x 4.5". Our Frantic Stamper Precision Dies work in most consumer table top die cutting machines such as the Press Boss, Cuttlebug, Big Shot, vagabond, Boss Cut, and Grand Calibur. 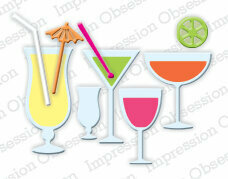 Summer themed Impression Obsession craft die featuring party drinks. These are US-made steel dies compatible with most table-top die cutting machines. This is a set of 10 dies. The drinks range from 1-1/4 to 1-1/2 inches wide x 2 to 2-1/2 inches tall. This set creates fun cocktails with accessories, perfect for celebrations or vacation layouts. Includes 11 dies. Size Largest: 2.68 x 3.03 inches, Smallest: 0.71 x 0.59 inches. Craft dies featuring an ice cream cone, a donut, a popsicle, and watermelon. Karen Burniston dies will give an added touch to any paper project and are compatible with most die-cutting machines. Marianne Design A5 Pretty Paper Bloc Boho Summer. This paper block features Summer colours and summer designs. Includes 8 designs. 4 x 8 designs. Size: A5 5.8 x 8.3 in. Summer themed craft dies featuring flip flops, a swimsuit, and a shovel and pail. Quickly and easily die-cut shapes from patterned paper, cardstock and other thin materials! Echo Park Designer dies are a cut above the rest. Compatible with most manual die-cut machines. Joy! 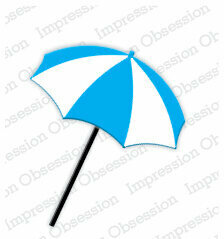 Crafts Cut-Emboss Die 3D - Beach Chair + Umbrella. Pretend you are soaking up the sun with this beach chair and umbrella... Great for vacation/travel/beach cards and layouts. 1 die. Size: 2.20" x 2.52".